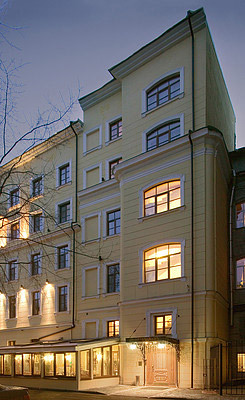 Nevsky Hotel Moyka 5 offers a superb location next to the River Moika, only a 5-minute walk from the Hermitage, Palace Square, and the Pushkin Museum. A tasty complimentary breakfast is served either in the cozy indoor cafe, or outside at the attractive courtyard cafe terrace. When inside, enjoy a lovely art exhibit of contemporary Saint Petersburg artists. The Nevsky Moyka 5 offers excellent value-for-money. There are even 6 rooms with a sauna and Jacuzzi. Write home about the perfect location and Moyka 5, using the free Wi-Fi internet access available. When going out, ask at the friendly ticket desk for advice. For longer trips, rent a car. 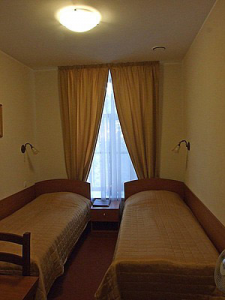 Moyka 5 Nevsky Hotel is only a 5-minute walk from the Savior-On-Blood Church, and 10 minutes from Nevsky Prospekt. single standart 6 800 руб. 5 900 руб. 3 800 руб. twin standart 7 800 руб. 6 800 руб. 4 600 руб. Superior 8 200 руб. 7 200 руб. 4 900 руб. Luxe 9 990 руб. 8 600 руб. 6 800 руб.